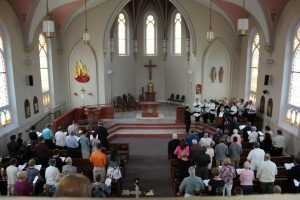 Light of Christ Catholic Parish was established on July 1, 2010 resulting from the merger of two neighboring parishes: St. Peter the Apostle and St. Alphonsus. 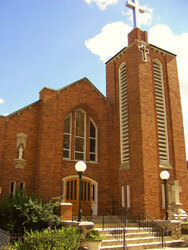 The parish is centered in the two communities of Blissfield and Deerfield. nine miles distant from one another in southeastern Michigan on the Ohio border. Light of Christ Parish also serves a large area surrounding these two communities including the villages of Petersburg, Britton, Riga and Palmyra, MI. Primarily an agricultural community, Light of Christ Parish consists of almost 700 families. The two parish communities effectively worked together for eleven months prior to their merger under the direction of the pastor, Rev. Jack Loughran, O.S.F.S. and a Transition Team consisting of members from both sites. This effort provided for a smooth transition from two parish communities into one. In that time the following mission statement for the parish was developed by the members of the combined communities and approved by the Pastoral Council: We, a Catholic community united in faith, bring the light of Christ to God’s people through worship, education and service. Please spend time on our website to learn about our parish and share the light of Christ among us. Prior to the founding of St. Peter’s the Catholic community in Blissfield would travel the nine miles to Deerfield by horse and buggy to celebrate mass. In 1910 the parish was founded and in the beginning masses were celebrated in family homes. As numbers attending mass grew the parish moved temporarily to the former Eagles Lodge above the local drug store. 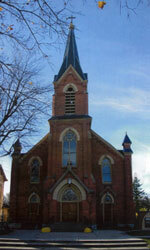 In 1912 the church was erected on South Lane St. and a priest, who was also the chaplain of St. Joseph’s Academy in Adrian, MI, was named pastor. In the mid 1920’s the church burned to the foundation. Parishioners quickly began plans to rebuild on the same site and the new church was finished in 1928. In the interim mass was celebrated at the local American Legion Hall. At the time of the merger St. Peter the Apostle had 320 families. Was founded in Deerfield, MI in 1864 primarily by French and Irish Settlers from the northeast United States and Canada. Historically a farming community many of the current parishioners are descendents of the original founding families. The first priests, members of the Redemptorist priests and brothers, would travel by train from Monroe, MI to Adrian, MI stopping at various places in between to meet the local Catholic community and celebrate the sacraments for them. The current church building is the third one of the community. The first church was a log cabin just west of Deerfield that was replaced by a small church at the current location. Outgrowing that space the current church structure was built in 1896 utilizing to a great deal volunteer labor and donated materials from the parishioners. At the time of the merger St. Alphonsus had 350 families.